Terroir:Select parcels lie at 1,800 feet above sea level are Guyot-trained on clay soil with yields of 32 quintals per acre. 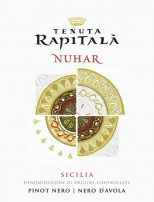 "The 2016 Sicilia Pinot Nero Nero d'Avola Nuhar is a blend of two grapes that may seem like total opposites but that are actually more complementary than you might expect. This wine offers the delicate wild berry and blue flower aromas that are characteristic of Pinot Nero with Sicilian aromas of toasted pistachio and wild fennel that are common to Nero d'Avola. The blend of these two grapes results in a soft and silky approach. You could pair this wine with white meat or swordfish steaks. Only the Pinot Nero sees nine months in oak. You get great value here and 20,000 bottles were made."